You may be asking, what is the Polish Armoire? Is it a blog about what Polish people have in their wardrobes? Is it about a nail polish full of wardrobe? Err I mean is it about a wardrobe full of nail polish? Well I hope the below photo clears up any confusion you may have! Update: After searching the great land of Google for walk-in armoires I have discovered that they DO exist! But I digress. You probably want to find out how I created the above mani (also known as my favourite stamping creation to date). I created this back when I had first discovered the existence of nail stamping and had bought a bunch of konad plates. I couldn’t decide on which design to use when I thought: why not do a skittle stamping design? Sidenote: I have since discovered that “skittle-mania” is very common when a person has a plethora of new polish or stamping options and is faced with the dilemma of choice. It is quite an amusing phenomenon to observe. Konad Special Nail Polish in Blue, White, and Red – bonus points for guessing the country flag the order of these colours represent! 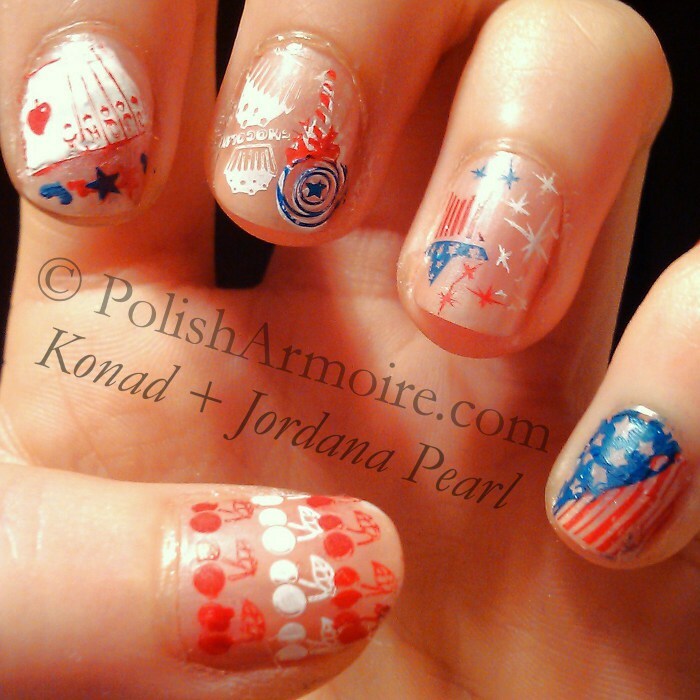 Tags: Konad Stamping, Sheer Nail Polish. Bookmark the permalink. That’s a whole lot of stamping! I am passing the Liebster award to you for a job well done on your blog. It’s a delight to read. Thank you Neilanie! Haha yeah, it was my first time stamping so I didn’t realise how long it would take. By the time I realised, it was too late to go back as I’d invested too much time in it 😛 I also love the name of your blog, I think that I’d probably work for polish!